As with FFG’s smash hit ‘Star Wars X-Wing‘, ‘Armada’ is a miniatures-based strategy game of intergalactic warfare featuring the iconic spacecraft from the ‘Star Wars’ universe. 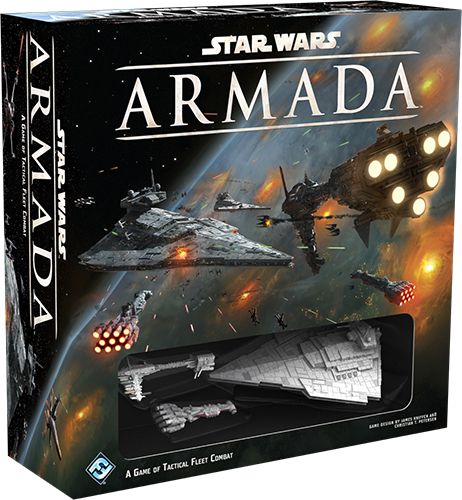 But while ‘X-Wing’ focuses mainly on smaller dogfighting starships, ‘Armada’ puts players in command of the massive capital ships from the Imperial Navy or Rebel Alliance fleets. 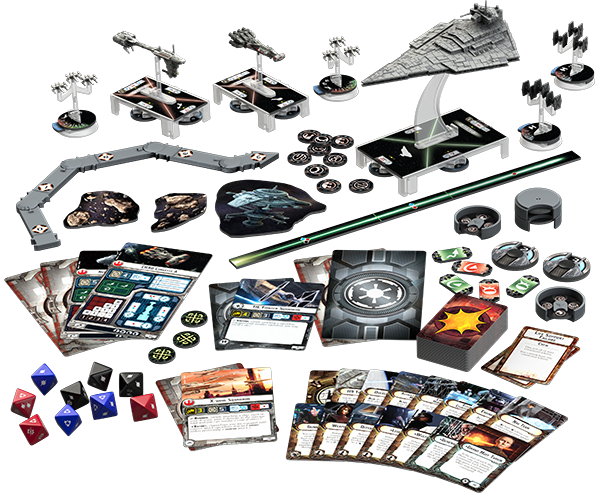 The ‘Star Wars Armada’ Core Set contains everything required to get started including the rules, an articulated maneuver tool, a range ruler, six command dials, nine attack dice, ten unpainted squadrons (6 TIE Fighter and 4 X-Wing), more than 130 cards and tokens, and three pre-painted ship miniatures – the Victory-class Star Destroyer for the Empire, and the Rebels’ Nebulon-B frigate and CR90 Corellian corvette. Although the Core Set can technically be played by itself, it’s mainly a starter set. After a few games, players will want to add new ships to their fleets by purchasing additional expansion packs. Most expansions include a new capital ship and a variety of upgrades, but some introduce alternative squadrons like A-Wings, B-Wings and Y-Wings for the Rebels, or TIE Advanced, TIE Bombers and TIE Interceptors for Imperial players. These squadron packs also give access to legendary aces such as Wedge Antilles, Soontir Fel and, of course, Darth Vader. Before playing the game, players have to first assemble their fleets. This is accomplished via a point system. Every component from capital ships, squadrons and upgrades each has a point value assigned to it, and each side can only utilize a certain number of points when building its army. This enables players to fully customize their fleets with different abilities. You may recruit officers like Leia Organa or Wulff Yularen, retrofit your ships with Expanded Hangar Bays or H9 Turbolasers, or even christen your ship with a title like Dominator or Dodonna’s Pride. The recommended point allotment in the Core Set is 180 points, but the point limit for standard games is in the 300-400 range. As for gameplay, players take turns (beginning with the player with initiative) activating one ship each round. Players assign command dials to their ships at the beginning of the game and at the start of each round. When a ship is activated, its command dial is revealed. Some of the larger ships have multiple command dials in a stack, so this requires some planning ahead for future turns. There are four basic commands a ship can be given: Navigate, Squadron, Repair and Concentrate Fire. Navigate allows a ship to change its speed and yaw. Squadron lets a certain number of fighters move and attack (and sooner than in their own phase). Repair recovers/reassigns shields or repairs hull damage, and Concentrate Fire boosts attacks with an extra die or reroll of one die. If the command isn’t going to be used, however, the ship can take a command token instead, which is basically a watered down version of that particular command that can be saved for later. After the Command Phase, the ship may perform two attacks. Unless otherwise specified (i.e. from certain upgrade abilities), a ship may only attack once from one of its hull zones in any given round. For example, you can attack from your front hull zone and left hull zone, but can’t fire out your rear hull zone twice. Ships have different attack dice pools depending on the hull zone, range of the attack (measured by a range ruler), or if firing at squadrons. Black dice are more powerful but can only be used at close range, blue dice can be used at close/medium range, and red dice are the weakest but can be used at close/medium/long range. Unlike ‘X-Wing’, ships in ‘Star Wars Armada’ do not roll dice when defending. Rather, ships and some squadrons have defense tokens at their disposal. 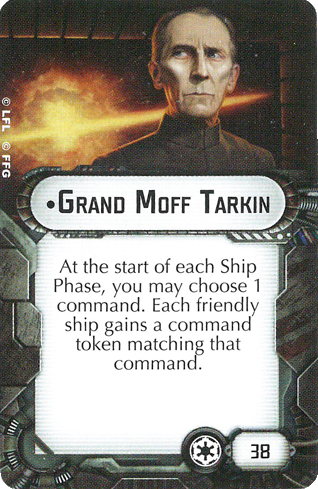 The tokens that these ships and squadrons can use are listed on their cards. Brace cuts the total damage from one attack in half (rounded up). Redirect allows damage to be transferred to the shields of an adjacent hull zone. Evade can cancel an attack die at long range or reroll an attack die at medium range. Lastly, Scatter (which is only found on certain squadrons) can completely evade an attack. Defense tokens are exhausted when used and replenished for the next round, but under dire circumstances exhausted tokens can be spent as well – though at a price, as doing so loses that token for the rest of the game. Once the ship has made its attack(s), then the ship gets to move. ‘Star Wars Armada’ uses an innovative movement tool (shown above) that gets inserted into the ship’s base and can be bent – or clicked – a number of times depending on the ship’s capabilities. A ship’s card will tell you how many clicks can be made at your current speed, plus you can add one additional click if you’ve chosen the Navigate command earlier (but only the dial, the token doesn’t do anything here). Then, the ship is moved along the template to the next spot according to that ship’s speed. If squadrons are in the way, they’re just removed from the table during the move and the opponent gets to put them back into play around the ship. But if another capital ship is in a ship’s path, then not only is the ship forced to decrease its speed temporarily as necessary, both ships also receive damage cards. Can you say, “RAMMING SPEED”? 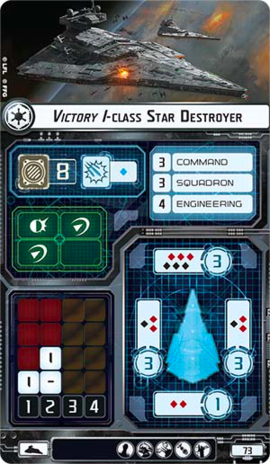 Once each player has alternated activating his ships, the Squadron Phase begins – with each player activating two squadrons at a time. Squadrons can either attack OR move in this phase, and their bases have a slider on them to make it easy to see which squadrons have been activated or not. All squadrons have the same restrictions in that they can only attack at distance 1 (using the range ruler) and can’t receive or dish out critical hits. 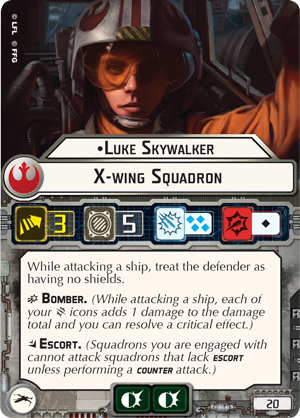 Some squadrons, such as Luke Skywalker, are also more powerful than their standard counterparts. Squadrons are an important element of the game as they tie up opposing squadrons (engaged squadrons can’t attack capital ships) and the amount of damage they cause can really add up over time. 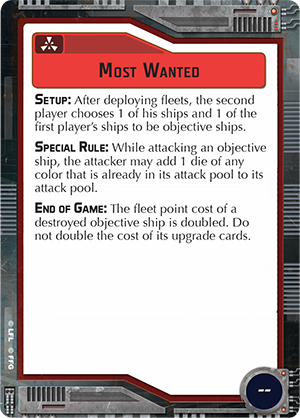 Making ‘Star Wars Armada’ even more challenging is the introduction of Objective cards. Each player chooses and brings three to the table, one of each type: Assault (red), Defense (yellow), and Navigation (blue). The Objective that is used for a game depends on a variety of factors, and they can change anything from the set-up to winning conditions. Since you never know which objective will be selected for a game, they can really throw a wrench into your plans and make you think on the fly. What I love about ‘Star Wars Armada’ is that the game really captures the essence of leading a fleet of starships being sent off to war. Every decision you make – from when to strike with your squadrons to knowing the right time to redistribute your flagship’s shields or begin repairs on its hull – can have a major impact on whether you win or lose. Timing is everything, and you will often find yourself having to think one or two steps ahead. This isn’t some shoot ’em up game; there’s quite a bit of depth and strategy involved. The ship models are also very impressive and a major selling point. Even the squadrons, though unpainted due to their teeny size, look amazing on the table in the heat of battle. My only complaint – and I really hate saying this – is that the Victory-class Star Destroyer is actually too detailed. What I mean by that is that this ship has this super thin molded plastic antenna sticking out at the top that looks great and all, however it’s just begging to be accidentally broken off. Mine is already bent, unfortunately, as this thing makes it extremely awkward to store safely. For a tabletop game that’s going to be handled quite a bit, the antenna just isn’t very practical and should have been left off in the first place. Other than that, I really can’t recommend ‘Star Wars Armada’ (along with ‘X-Wing’) enough. Fantasy Flight Games knows how to put out fun, engaging and top quality products with extensive replay value. This is definitely one of its best.